Visit clippercard.com to order an adult card online or find an in-person location. Youth, seniors, and customers with disabilities may apply for a discount Clipper card. You can add cash value, transit passes or any combination online, over the phone, or in person at a retailer or transit agency ticket machine. Clipper makes it easy to ride transit in the Bay Area. You can add value to your card as you go. Clipper automatically figures out transfers and discounts are available. 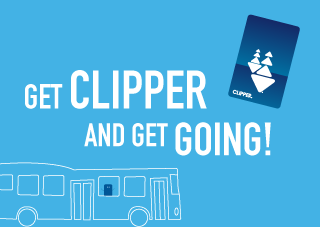 Clipper is the all-in-one transit card Clipper makes it easy to ride transit! Learn more at clippercard.com. This site is operated by MIG, Inc. on behalf of the Metropolitan Transportation Commission. ©2017 Metropolitan Transportation Commission. All rights reserved.